Homophoberia cristata Morrison, 1875, Proc. Boston Soc. Nat. Hist., 18:125. 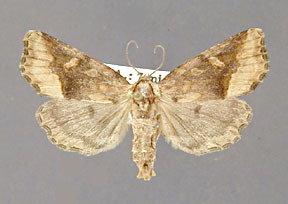 Eustrotia caduca Grote, 1876, Canad. Ent., 8:207. Eustrotia retis Grote, 1879, Canad. Ent., 11:198. Diagnosis: Homophoberia cristata is a brown species. In particular the median area of the forewing is brown and contrasts with the yellow-brown subterminal and terminal regions. The characters distinguishing this species from apicosa are given under apicosa. 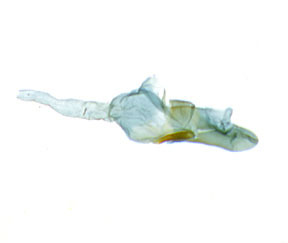 In particular the male has bipectinate antennae, the species is slightly larger, and the forewing is, in general less contrasting than in apicosa. There is no black dot on the outer margin of the hindwing and no black triangle on the antemedial line of the forewing. Distribution: This species is much rarer in collections than apicosa and it seems to have a more restricted distribution. Like apicosa, cristata is a species of eastern North America. In the north it has been collected in Ontario and Michigan. The species occurs southward to northern and middle Florida and westward to Illinois. The species has yet to be collected west of the Mississippi River. Females are slightly larger than males. 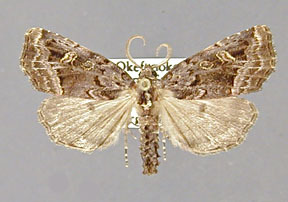 Some specimens have white streaking on the veins of the forewing, particularly the medial veins in the subterminal region. In other specimens the forewing lacks this streaking. This white streaking is more prevalent in males than females, but does occur in some females. 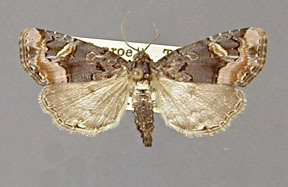 The intensity of the yellow-brown in the outer third of the forewing is variable, although part of the variability seems to depend on the freshness of the specimen. Females are slightly larger than males. Adults have been collected from early may to August in the northern and central part of its range, a slightly earlier and later in the southern reaches of its distribution. Larva: The larva is green in overall coloration. There are narrow white lines middorsally and ventral to setigerous tubercle II. A small bright red spot exists at the posterior margin of each segment, except the prothorax, ventral to the white subdorsalline. 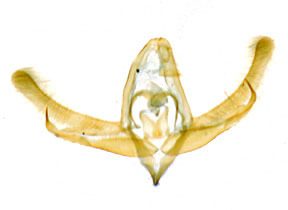 The spiracles are white and are partially margined with red. The head is yellow speckled with black. The larvae are not strictly aquatic, but can swim strongly with an up and down movement of the back half of the body (Kellicott, 1891). According to Dyar (1909) the larvae pupate on land and must swim from their foodplants to the shore. 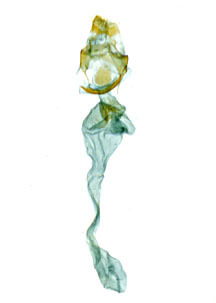 Foodplants: The larva has been reared from the leaves and fruits of the yellow pond lily Nuphar luteum (Nymphaeaceae) under the name Nymphaea advena. The characters distinguishing this species from apicosa are given under apicosa. In particular the male has bipectinate antennae, the species is slightly larger, and the forewing is, in general less contrasting than in apicosa. There is no black dot on the outer margin of the hindwing and no black triangle on the antemedial line of the forewing.